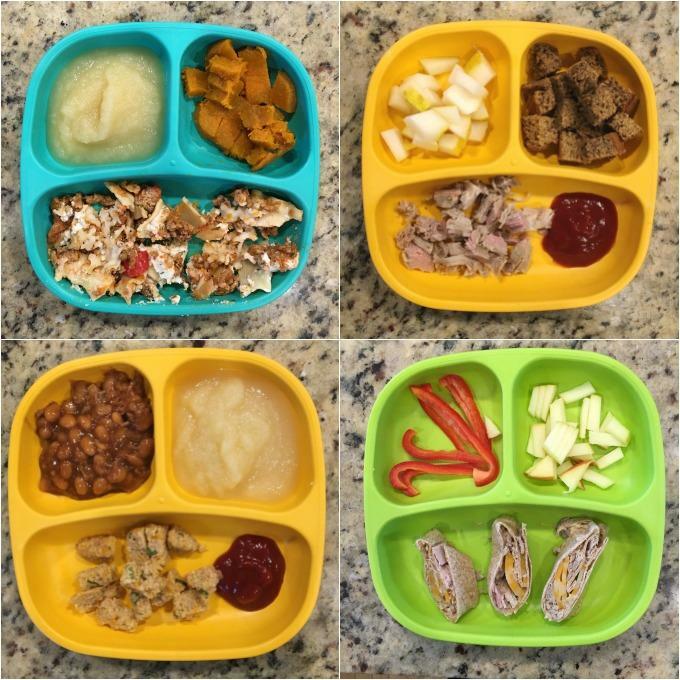 Looking for healthy toddler meals to feed your kid? 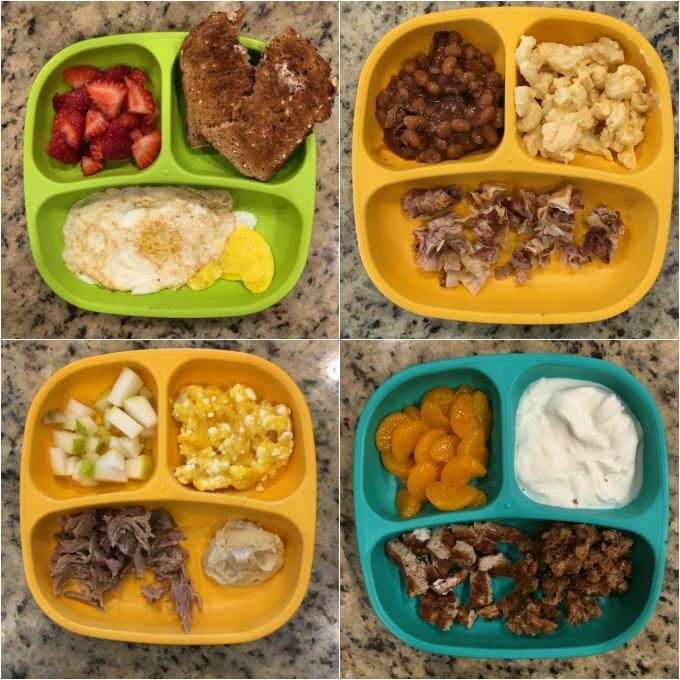 Here are 40 ideas for breakfast, lunch and dinner to help inspire you if you’re stuck in a rut! I know I said I was going to try to post these monthly….but sometimes life gets in the way. So for now, I’m just going to save them up until I have a decent amount and then do a post like this! 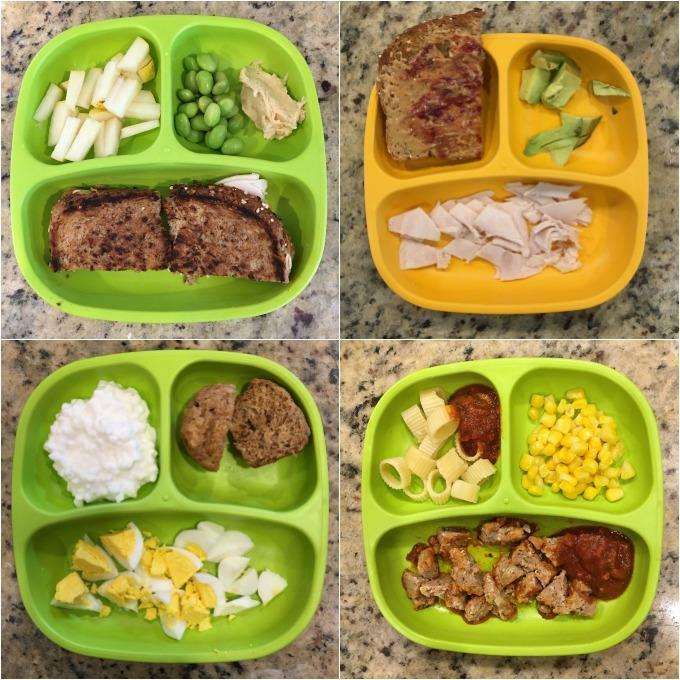 Hopefully this helps inspire some parents who might be stuck in a mealtime rut! 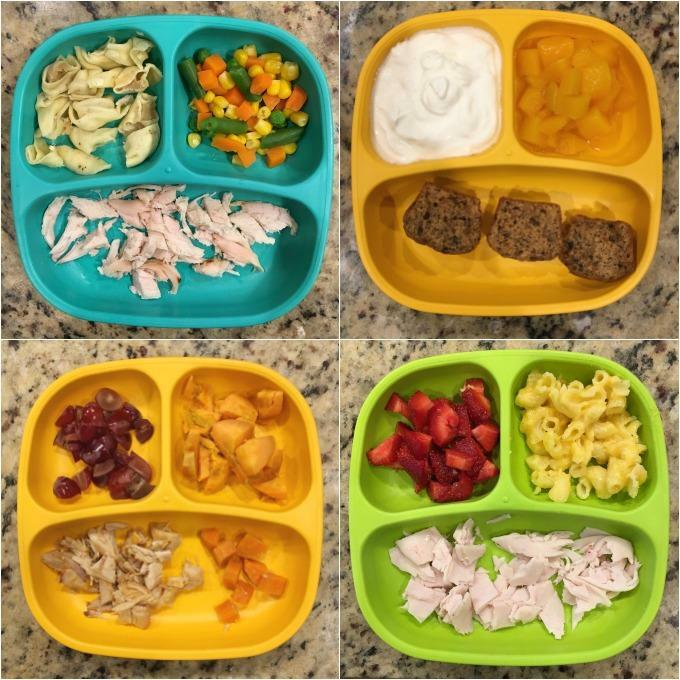 These are some of the actual meals I’ve been feeding my almost two year old lately. Does he always clean his plate? No. Does he always eat the fruit? Yes. Is he fairly willing to try pretty much anything I put on his plate? Yes…which makes me happy, even if he spits it right back out. Sure I could easily feed him the same few things every day….and sometimes I do fall into that rut because it’s easy…but I do my best to feed him a variety of real, whole foods. 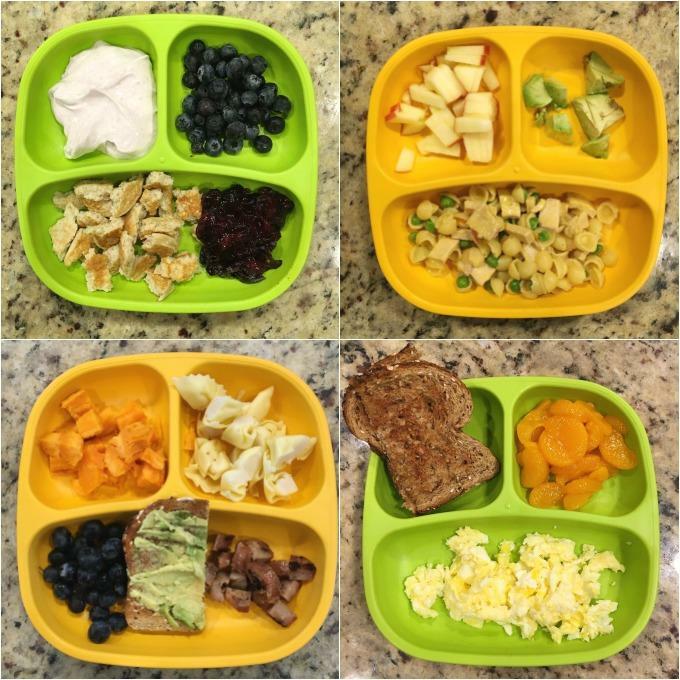 If you’re interested, these are our favorite plates and they’re from Re-Play Recycled. (Affiliate link) And if you want to know more about my feeding philosophy, you can read Why My Toddler Doesn’t Always Eat What I Eat. See any ideas that inspired you? Be sure to pin this post to inspire others as well! Honestly it’s like you read my mind! haha I was looking on Pinterest last night for exactly this! You’ve mentioned that your child doesn’t always clean up his plate. If he doesn’t, do you give him something else to eat? To me, it looks like you’re portioning doesn’t look like you are giving him enough. Or is that really how much a toddler eats? I like the fact that you’re giving him variety of foods though. My kids are so picky. Most of the time they only eat one kind of food at mealtime. It’s either mac n’ cheese only, fries only, or rice n’ beans only. Fruits would be later on for snack. Meats are very rare in their meals. ( I am not vegetarian. They just don’t like it). 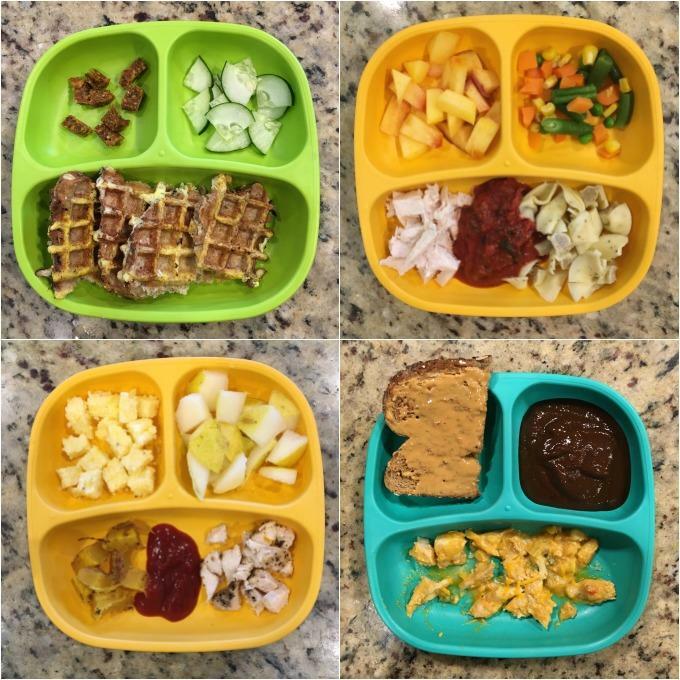 I’d like to try how you prepare your kid’s meals. I think your portions are perfect! They say when children first become toddlers their appetite will decrease and this seems like such a reasonable amount of food. You can’t force your children to eat more than they want. Are you making your own baked beans or do you have brand that you recommend? I’m going through this post for some inspiration 🙂 Thank you! I’m working on a homemade recipe but not having much luck. We always get them from the takeout bbq place ad he loves them but i haven’t been able to get him to eat the ones i make at home yet. Gonna keep trying! My little man is a very picky eater. Or maybe it’s me? We eat slot of chicken. One because it’s cheap and two because I don’t like a lot of beef, but we will eat it… Anyways I feel like my child just keeps playing with his food and isn’t eating it. Could be I’m not making it interesting enough for him… I feel like I have ran out of ideas. Hi Lindsay! I really like this post! I was wondering where did you buy those plates? Thanks! 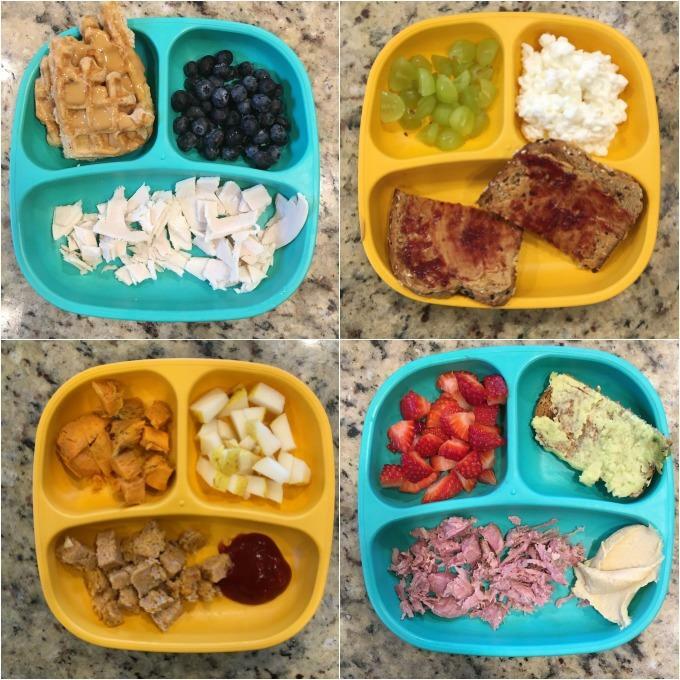 Thank you so much for these toddler plate ideas! My little one is 13 months with 4 teeth (2 top and 2 bottom). She’s refusing to eat pureed foods now, but is super picky with solids. She won’t eat meat or vegetables. She just wants fruit and cheese. I’ve decided that I’m going to make these toddler plates for her from now on. If she doesn’t eat them right away, I’ll try again an hour later. Ideally, when she’s hungry and she knows there are no other options, I’m praying she will be willing to try new foods and (hopefully) like them! good luck! mine would eat just fruit and cheese too if i let him! Very useful guide. I can see I’ve been expecting my toddler to eat too much maybe that’s why he isn’t eating well. 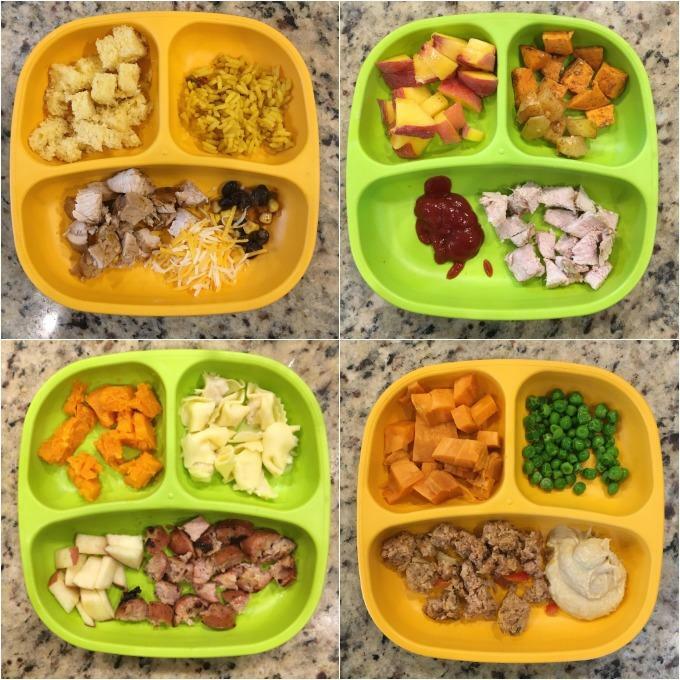 Love your posts on Healthy Toddler Meals. 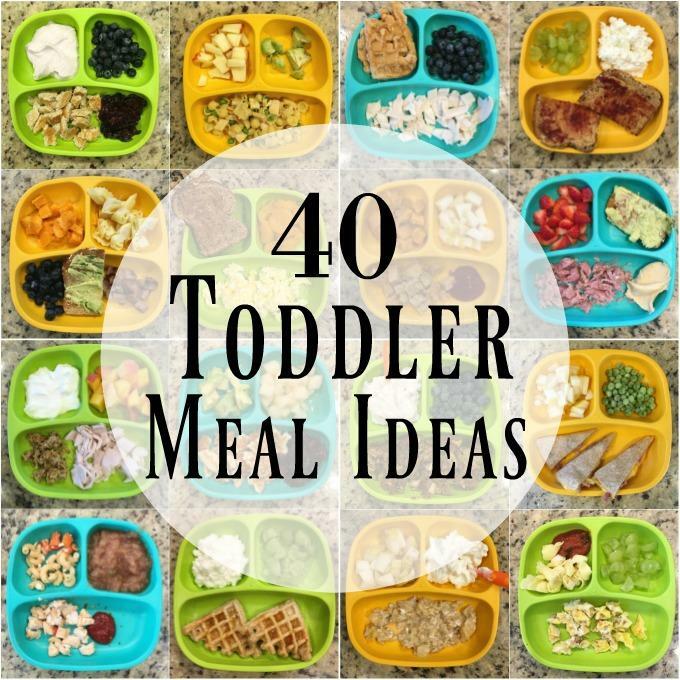 Gives me lots of ideas since I struggle with my 18 month oldʻs menu. Can I ask, what kind of sausage do you have in your meals? most of them are just the Meijer brand chicken sausage. I try to find the lowest sodium versions i can. Hello, Lindsay. 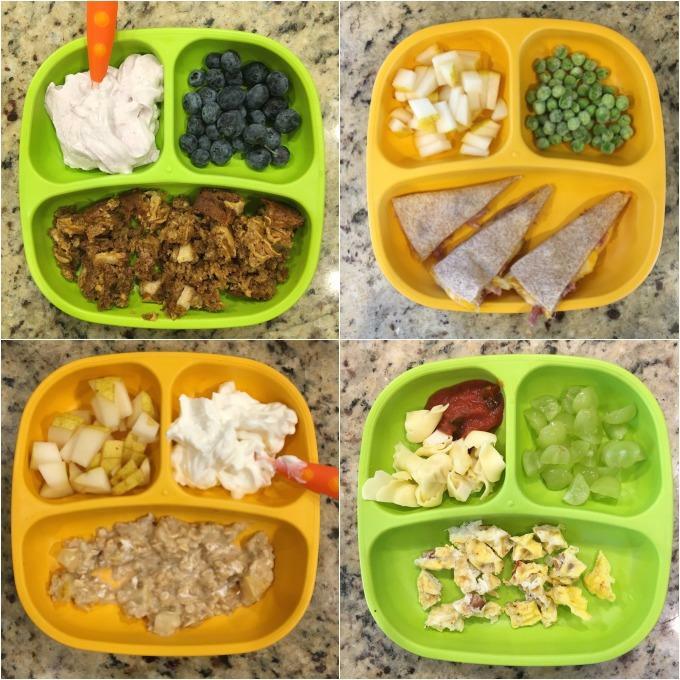 My son is 2 and I am trying to feed him healthy meals and snacks. What bothers me is that everything is packaged and canned. In your opinion is there much difference healthwise between unsweetened fruit cups and whole fruit or home-baked bread and store-bought bread? Frozen vegetables vs fresh ones? Lunch meat? I can go on and on. Thank you! for things like canned or packaged fruit i look for varieties canned in juice only with no added sugar. For bread I look for minimal ingredients, lower sodium and higher in fiber and protein. for lunch meat I look for minimal ingredients and lower sodium. I think frozen veggies are a great option and can often be more nutritious than fresh ones that have been sitting for a while! Great ideas! I have seven toddlers in my daycare home and struggle to have variety-I tend to find something they all like and use it to death! Also, I LOVE, LOVE ,LOVE the Re-Play site!!! I got right on Amazon and ordered 8 plates & bowls in 8 different colors, and as soon as they arrived and I saw how awesome they are, I ordered 8 tumblers to match them! My kids are so excited about them, too! This article taught me the importance of exposing my firstborn to a variety of foods. She is a great eater and requests whatever I have. 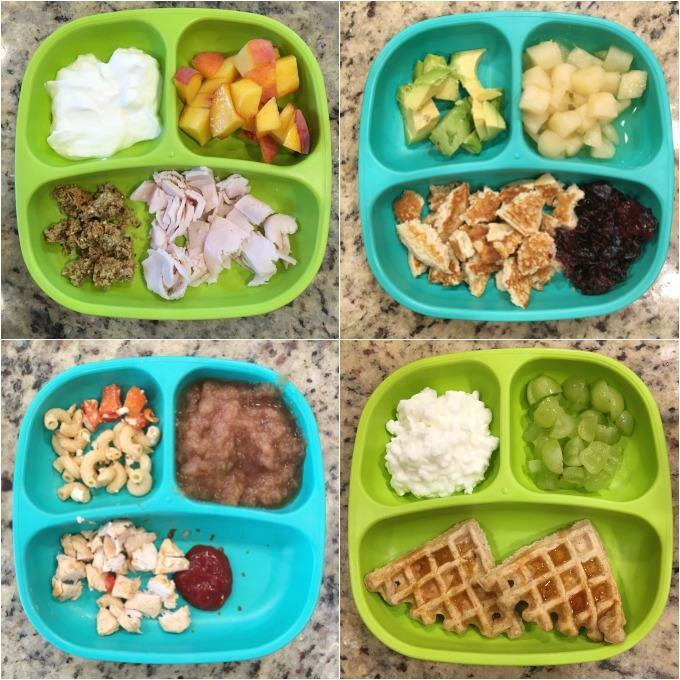 Thank you for the encouragement and guidance when meal prepping for my first child. You were really helpful as she transistioned from breast milk to solids. She’s now a healthy, adventurous, 2-year-old eater. This is a great list of ideas. However, do you have a link to go with the ones that have a recipe? the ones that have recipes are hyperlinked in green! if i link it earlier in the post and then repeat it, sometimes i don’t like it a second time!